If you are one who has used medications and therapies for serious health problems, you will quickly learn the unwritten rule : “what works for one may not work for another, everyone is different“. One can infer each Homo Sapien is biologically different from the next, Same goes for their sum total of subjective experiences. The individual has characteristics that are unique. I am pretty sure that a universal model does not apply when talking about all people, most of the time. But we also, in talking about the human race per se , or groups… education ,communication or interactions ..need to talk about more than just the individual. I certainly want to know more than the individual that is me. As I am a subject of my own permeated world that I participate in, other persons are the subject of their own. As subjects we have considerable influence upon the world. a subject acts upon other things. In the shared circumstance, such as that of a conversation, or any other interpersonal experience, Each must treat the “other” as a subject of overlapping or joined existence– an intersubjective circumstance. Intersubjectivity. Kohn goes on the explain intersubjectivity in a meeting (conversation, circumstance, Dasein etc) . After the two fold contrast of Self and Other arises; and two subjects recognize an intersubjective meeting, A twofold attitude with the contrasting of sameness and difference arises. This is not a state between sameness and difference, according to Kohn, rather a “dynamic tension of the two”. I would postulate that one is often comforted in the sameness beyond humanness in a intersubjective moment. A subject maybe comforted in the sameness of culture, age, gender, ethnicity, ideology. Perhaps, for better or for worse,the Sameness we find in other people confirms ones own identity. We are at the same time excited by the novelty of otherness, sometimes startled…. sometimes curious. If man is to reach beyond his own hands grasp , it could be said one seeks out otherness beyond himself. In interpersonal relationships, we very often find another person’s Otherness, including the persons individual experiences and circumstances, compelling or alluring. Many Neuroscientists believe that they have located “Mirror neurons” in the human brain. These neurons are believed to activate when we observe other people actions. In certain developmental stages (the experts argue the exact ages) one learns by observing others, an interpersonal action. and that they impact and influence as subjects within their own experiences… this is understanding takes a practical leap of faith. But this understanding, which requires assumptions supported by a subjects growing experiences, lifts one beyond dull solipsism and egoism , to the richness of an intersubjective matrix, which is our human world. Modern Physics may suggest a “subject:object” or “I:it” outlook as impractical. All things have influence on all other things in a field, whether the affect is grand or arbitrary. Any subject acting on a body, whether a stone, tree, another person, earth, sun, is influenced by the other in return. Objects are not static or inert. 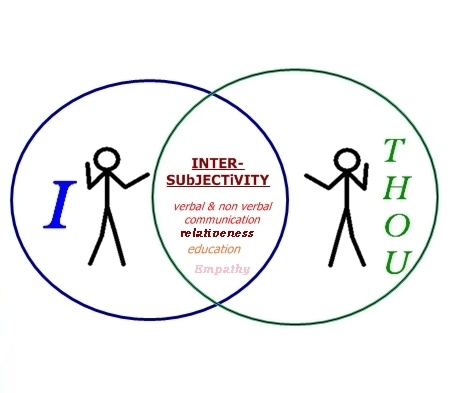 For the purpose of interpersonal subject:subject or intersubjective relationship We may as, Martin Bubers suggest, choose “I:thou” interpretation over “I:it” . The rich understanding of other people in their Dasein beyond ones own existence is one thing and Learning from others another. We also have to live with each other in space and our societies. If I am ” to treat others in the manner I wish to be treated“, Wouldn’t I have to know what is it like to be in another circumstance? I am Reading Alfie Kohn’s ” The Brighter side of Human Nature“. Which postulates an individual’s existence is ideally positioned somewhere between the poles of Egoism and Altruism, and the motivations of an individual lies somewhere between self-interest and pro-social selflessness. Spatial and perceptive: imagining what its like to be in someone else’s physical circumstance. Empathetic: Being affected by another’s circumstance. Cohn synthesizes the work of scientist(including doctors , biologists) , psychologist, educators, and philosophers and the book is heavily annotated. Cohen further illustrates the importance of understanding intersubectivity in interpersonal relationships, to promote the pro- social(or altruistic) and motivations and actions of individuals. He makes a strong case for an the Altruistic interests of the individual beyond self interest. I would recommend the book for all, but especially humanists, individualists and existentialists. To be a subject in Existence is moral participation. To act upon and with others requires Dignity, Reciprocity, and Tolerance, (Ethics) in addition to subjects self -interests and mutual interests with others.